4 Time National Karate “Games of America” Champion (SGA) held in Colorado Springs, CO Sanctioned & Judged by the USA Olympic Committee. 9 Time MKA Champion (Triple, Double & Single). 3 Time MKA “Competitor of the Year (2006, 2011 & 2013). 12 Time MKA Grand Champion. 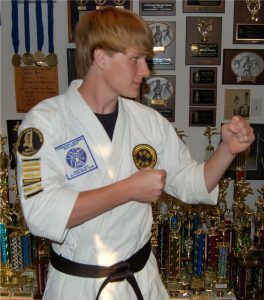 6 Time State Games of MS Champion, 5 time “Male Martial Artist” of the Year. SGM “Overall Sportsman of the Year” ’06. Honored by Governor Barbour & LT. Gov. Amy Tuck (2007) & 2 Resolutions passed by House & Senate in his honor. 5 Time AAU Champion, State & Texas Regional, Super Regionals & AAU Nationals 2010 in New York.